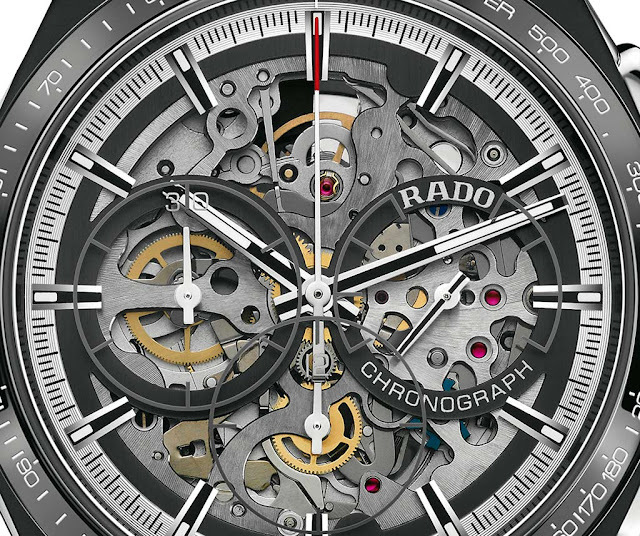 The new Rado HyperChrome Skeleton Automatic Chronograph is crafted from matt black super hard high-tech ceramic though a process which starts by firing ceramic components with black pigment at 1450°C in a high-tech oven. Sand blasting is then used to develop the matt black finish of the monobloc case which is here combined to a polished bezel with engraved tachymeter filled with white lacquer and side inserts in polished stainless steel with hardening treatment. Push buttons and crown are also made in stainless steel. 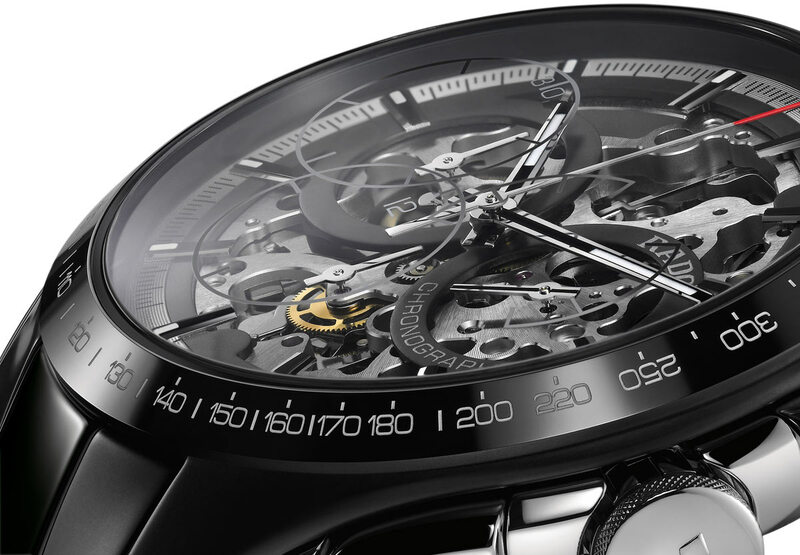 Plate and bridges of the open worked movement are cut away to expose the inner design elements. Despite its skeletonisation, the dial maintains good readability thanks to its rhodium coloured applied indexes with black veneer and white Super-LumiNova. 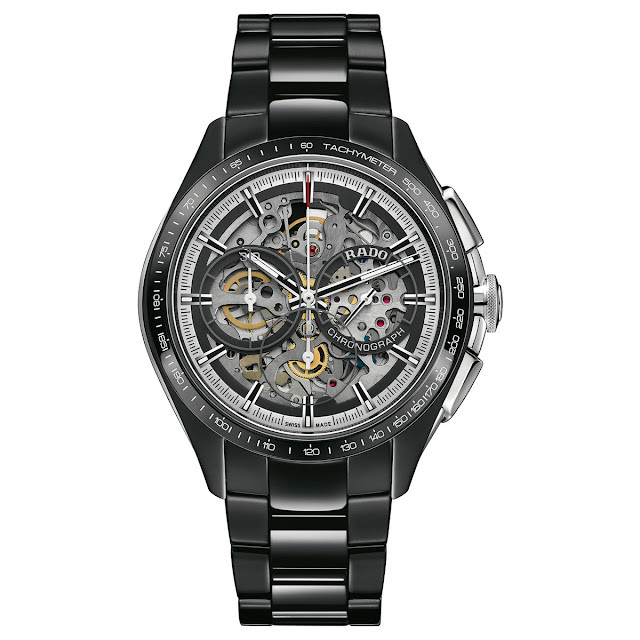 The red-tipped seconds hand enhances the sporty character. The curved sapphire crystal has an anti-reflective coating on both sides. Thanks to its lightness and scratch resistance, the Rado HyperChrome Skeleton Automatic Chronograph can be worn all day with great comfort and without worries. 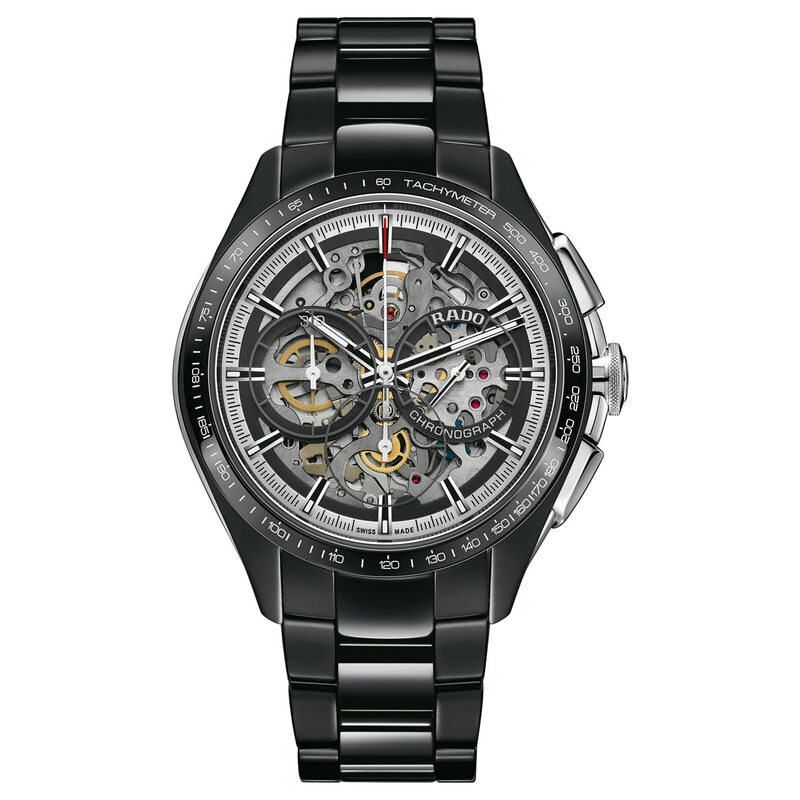 The 45 mm x 13 mm case houses the automatic ETA 2894-2 chronograph movement beating at a frequency of 4 Hz (28,800 vph) and offering 42 hours of power reserve. The three-row ceramic bracelet alternates polished and matt links and is secured by a titanium three-fold clasp with black ceramic openers. Interesting watch, nice design, love the matt ceramic case but the price is way too high IMHO. Rado HyperChrome Skeleton Automatic Chronograph Limited Edition. 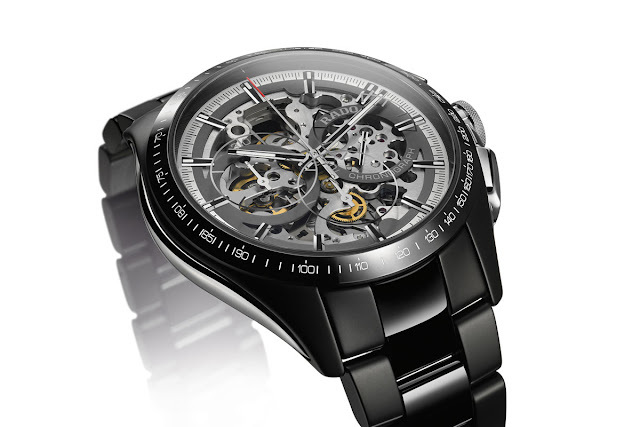 The new Rado HyperChrome Skeleton Automatic Chronograph is crafted from matt black super hard high-tech ceramic. The Rado HyperChrome Skeleton Automatic Chronograph ref. 653.0249.3.015 is a limited edition of 600 individually-numbered pieces with a price of Euro 7,150.